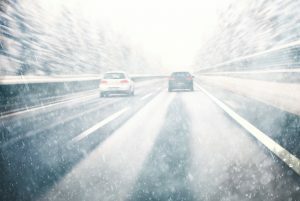 Under Massachusetts General Laws Title XIV, Section 17, motorists must factor weather conditions into account when determining the appropriate speed. Specifically, the law requires motorists to decrease their speed when “when a special hazard exists with respect to pedestrians or other traffic, or by reason of weather or highway conditions”. Thus, there may be situations where a motorist is cited for speeding although they are traveling at or below the posted speed limit. Earlier this year, one man was killed and three others injured in a multi-truck accident on the Massachusetts Turnpike (the “Turnpike”). According to a local news report covering the tragic accident, the collision occurred when the driver of a tandem tractor-trailer lost control of his rig while driving eastbound. The rig collided with several other trucks, including another semi-truck. Evidently, the accident took place around 2:40 in the morning during a particularly heavy storm, and police had actually reduced the speed limit on the Turnpike to 40 miles per hour. The accident is still currently under investigation, ad it is not yet known how fast the tractor-trailer was traveling at the time it lost control. However, due to the compromised weather conditions, police explained that tandem tractor-trailers were not supposed to be operating on the highway at the time. Have You Been Involved in a Massachusetts Car Accident? If you or someone you love has recently been involved in a Massachusetts car accident, you may be entitled to monetary compensation. At the Neumann Law Group, we represent accident victims and their families in car accident cases across Massachusetts. We also have offices in New York, California, and Michigan. To learn more about how we can help you pursue a claim for compensation for the injuries you have sustained, call 800-525-6386 today. Calling is risk-free because we will not bill you for our services unless we can help you obtain compensation for your injuries.